Baking, cleaning, finishing up a few things to go in the Easter baskets,continuing to sow seeds for the garden…today was the beginning of a busy week. I made Laurie’s ginger-carrot soup from Notes from the Hinterland and it was delicious! We’re still getting snow..flurries mostly and the temperatures are cold so chances are that we wont be having any daffodils or tulips anytime soon ouside. Luckily, the indoor plants are doing their best to make up for it. I may have been a little over enthusiastic in sowing the seeds for my cabbage patch. I have over 60 little plants. Cabbage is great for saurkraut, of course, and if you make your own you can add all sort of good things to it…carrots, kale, onions..even oranges. Delicious! I like to stir fry cabbage in coconut oil. It is sweet, a little crunchy and doesn’t smell like sulfur when cooked this way. Onions, fresh garlic and sea salt taste great with it. Pea pods make a great addition too. I have a lot of calendula started too. Fresh calendula petals added to stir fries, salads..even fruit salads make things look pretty and add extra nutrition. Dried petals retain their shape and color when added to glycerine soaps, vinegars and oils. In the garden, they are workhorses and make terrific companion plants. I notice the fruit flies beginning to hover and multiply over my seedlings. A little food grade Diamataceous earth sprinkled on the potting bench will take care of that problem in no time. It’s non toxic and safe for pets. Once it gets wet it is no longer effective. In the past, I’ve had issues with ants and japanese beetles in my old house. Last year I sprinkled Diamataceous earth in all the windowsills, along the perimeters of the cellar and on top of the beams. It really worked . Speaking of Cabbage Patches and little sprouts…my daughter is having a baby! The first grandchild! I added the last stitch to this happy little quilt last night. The first flower has sprung! Most of the snow in the front yard has melted. The back yard is still snowy but a heat wave of 60 degrees is coming so that should be gone soon. I was working in the front gardens today, mostly pruning and cleaning. After just a couple of hours, I realized that I am out of shape. I cooked up a batch of vegetables in some of my chicken broth and ran it through the blender when the vegetable were tender. Vitamin packed and good for the bones! I am excited that have a lot of work ahead of me and I want to be up for it. Hugh’s Views & News is hosting a Walking On Sunshine Blog Hop Party. I love this idea! 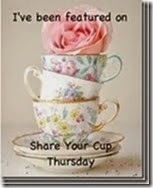 It’s a great way to share blogs with each other. There are so many wonderful sites out there! I hope he continues this so I can share and find more of you. Thank you, Hugh. It’s very easy to join in and there is not much involved. All you have to do is choose a fellow blogger and do what I am about to do below. I am excited to share a wonderful blog...Whispering Pines Farm. Carole has been blogging for 4 years and her site is filled with a wealth of information and lovely anecdotes about gardening, spinning, soapmaking, cooking, jellymaking, handcrafts, her animals (very dear to her heart) and more. One of my favorite of her recent posts is Owen.. it’s about Carole and the beautiful senior cat that she adopted. Carole is so knowledgeable and gracious. Her blog and her lifestyle have become a real inspiration for me. Choose a fellow blogger who you think spreads blog love. Write a short post about them. Entitle your post Walking On Sunshine Blog Hop Party (so others can find your post). Create a pingback to this post, so that the link appears in the comments section, so that other participants can read your post. Click here for details on how to create a pingback..
You can mention as many bloggers as you want in your post and write as much about them as you want, but try to not make your post too long. Enjoy the party everyone and keep spreading the blog love. Grey skies and snow this morning soon gave way to the sun. I’m glad it is officially Spring! My house smells like cooked cabbage today but I like it because it reminds me of my Grandparents. I still have the cup my Grandfather used for his supper tea. His parents came to the States from the county of Donegal. They raised their children in the tenements of Boston where she was a midwife and he was a policeman. Happy Saint Patrick’s Day everyone! Aside from getting a flat tire on the highway in Washington DC at midnight, (watch those potholes! ), it was lovely to get away from the snow for a few days. My husband had some business in Williamsburg, Virginia. Their spring seems to be slow starting too but it was definitely in the air. Doesn’t this macaroni and cheese look delicious? It was! This is what a roof rake looks like. It has come in very handy. I’m getting a lot of needlework and painting done in these long, cold nights. My cactus seeds sprouted into 7 little cacti so far. Still holding back on the major seed starting but I can’t resist starting a few early trays. I planted some blue hyssop. The bees love it but really I’ve planted it for my friend Arthur. When I had my shop, he would cycle in a mile or so every day to visit me . On his 80th birthday, he brought in a cassette player and some big band music and asked me to have a birthday dance with him. He loved Blue Hyssop. It will bring happy memories and good energy to my garden. We were snowed in again yesterday. At this point, it really doesn’t matter. I think I ‘ve gotten used to it. I spread my projects out on the dining room table and spent the day meandering through them all. It’s too early to plant up the seeds but a few pots here and there give me something to look forward to. It’s exciting to see the little sprouts coming through and to check them each morning. March 1 st came in like a lion so you know what that means!